The U.S. Army West Point Black Knights (9-2) and the Navy Midshipmen (3-9) clash this weekend in Philadelphia for the 119th Army-Navy football game, marking the end of the 2018 college football regular season. The Black Knights are looking to extend their winning streak against the Midshipmen to three. The Midshipmen, however, lead the all-time series with 60 wins to Army’s 51. The match has ended in a tie score seven times since the rivalry game began in 1890. So far this season, the Black Knights have beaten Air Force Falcons, and the Falcons have defeated the Midshipmen. With a win Saturday, the Black Knights can win the coveted Commander-in-Chief’s Trophy. President Trump will attend the battle between the Black Knights and Midshipman on Saturday. This will his first time visiting the rivalry game as president. Mr. Trump attended the matchup in 2016 as the president-elect. In May, he presented the Commander-in-Chief’s Trophy to the Black Knights. Mr. Trump will be the 10th sitting president to attend the game. That tradition began with Theodore Roosevelt in 1901. It’s custom for the president to sit on the Army’s side of the stadium for one half and the Navy’s side for the other. 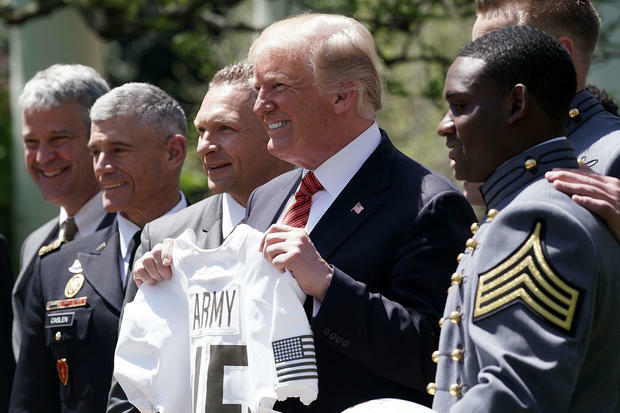 President Trump is presented with an Army Black Knights jersey on May 1, 2018. Mr. Trump will be on the field Saturday to officiate the coin toss during the game, West Point announced Thursday. “It’s an honor to have the president in attendance as the nation watches these men fight one another with every ounce of their being on the field, but when it’s all said and done, they will combine to form one of the most powerful fighting forces known to mankind – the U.S. Armed Forces,” West Point said in a statement.